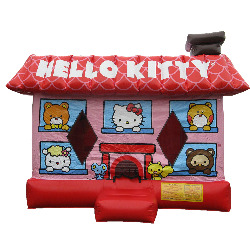 Here's the licensed Hello Kitty bounce house we've all been waiting for. You will love the beautiful artwork and the hours of fun your kids will have with their favorite Kitty and her friends. This is a larger than standard unit. Note: Not recommended for rain showers.